Nauruan locals who recently completed UNE’s Associate Degree in Teaching (Pacific Focus) are banding together to better their country’s schools. The Pacific focused Associate Degree in Teaching is one of two qualifications that make up the Nauru Teaching Project. 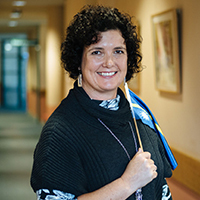 Led by A/Prof Penelope Serow and Prof Neil Taylor, the project was initiated by UNE in 2013 after the Nauru Government identified an increasing gap in its supply and quality of teachers. The Nauru Government partnered with Department ofForeign Affairs and Trade Australia and commissioned UNE to create the new internationally-recognised qualifications for pre- and in-service teachers in Nauru. The project is designed to improve local subject, content and pedagogical knowledge of teachers, as well as provide education specifically tailored to the remote Pacific Island context. 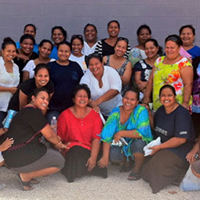 Since establishment, 21 Nauruan locals have graduated with an Associate Degree in Teaching. Eleven of those students have elected to further their study with a Bachelor of Education (Pacific focus). Putting their studies into practice, the graduates currently work in primary, secondary and early-childhood schools across the country. After completing their initial degree, they formed a support network, sharing strategies, comparing notes and supporting each other, for the betterment of education in their schools. Project Director, A/Prof Serow, explains how the group came about. “When they finished their initial degree we said, ‘Yes, you’ve finished your course, but now you are part of the UNE family. They took that very seriously and formed an alumni group to support each other,” she said. Most of these students are pioneers in their families, so their families have had a big learning curve coming to grips with what university education involves, and therefore a sense of community is important. This notion has been reinforced in research undertaken on the project, and the formation of an alumni group will provide this peer support. Later in the year the Office of Advancement will be launching an online platform for UNE alumni to connect and form their own online communities for such vital and beneficial relationships to be established and prosper.